Singapore, 28 February 2018 – YCH Group, Asia Pacific's leading integrated end-to-end supply chain management and logistics partner signed a Memorandum-of-Understanding (MOU) with Forchn Holdings, the sponsor of SGX-listed EC World REIT, to form a comprehensive strategic partnership. As part of this partnership, YCH and Forchn will leverage their network of assets across Asia Pacific. Forchn and YCH will also explore jointly launching a USD$150 million Belt-Road Initiative (BRI) Logistics Real Estate Private Equity Fund to explore investment opportunities of warehousing and logistics assets located in Southeast Asia and China along the BRI corridor. The partnership will also entail both parties closely working together on maximising the potential of each other’s real estate portfolio. MOU signing between Mr James Ong, Chief Investment Officer at YCH Group (seated L) and Mr Koh Chaik Ming, Managing Director of Forchn International (seated R). (Standing L to R) Mr Zhang Guobiao, Chairman of Forchn Holdings, Dr Robert Yap, Chairman of YCH Group, Ms Catherine Yap, Executive Director of YCH Group and Mr Chan Heng Wing, Lead Independent Director of EC World REIT witnessed the signing. The initiative to jointly launch a fund came on the heel of the announcement by the Chinese Government to include the Belt Road Initiative (BRI) within the Party’s Constitution as one of the focus at the recent 19th National Congress of the Communist Party of China. According to the New Frontiers report published by Knight Frank last month, Singapore tops the index as one of the most important market in the region that can contribute to the success of the BRI. “The fund would establish YCH Group as a key player in the BRI, and further strengthen our offerings in the Asia Pacific region. Many of our clients see the BRI as an opportunity, and now they would be able to tap on our infrastructures and expertise to expand and scale the reach of their businesses”, said Dr Robert Yap, Executive Chairman of YCH Group. Under the MOU, YCH Group would also collaborate with Ruyicang, Forchn’s e-commerce logistics subsidiary to explore joint offerings of e-commerce and omni-channel logistics services in the ASEAN and China region. According to a study by Google and Temasek last year, the Southeast Asia’s e-commerce market is forecasted to expand by eight times its current value to hit USD$88.1 billion by 2025. 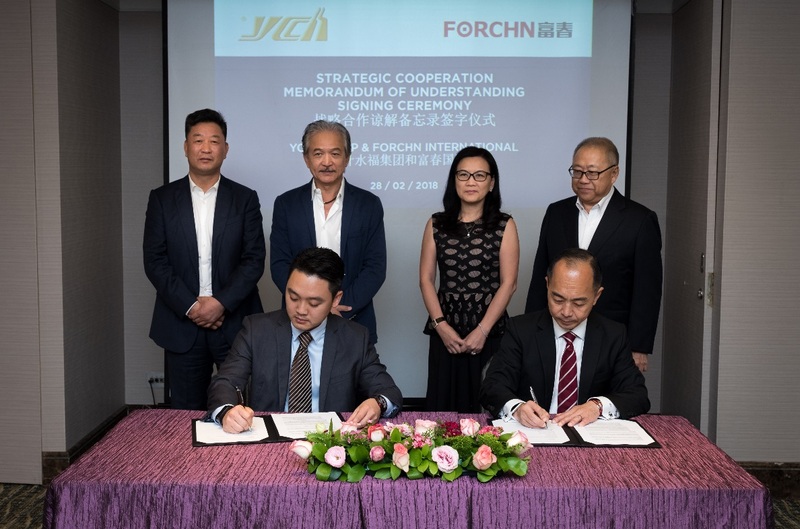 “The partnership with YCH Group is a key milestone for Forchn Holdings as we continue to expand beyond China through our overseas headquarters, Forchn International in Singapore. YCH is one of the leading supply chain and logistics operator in the Asia Pacific region, and this collaboration will ensure sustainability and cements Forchn’s position as a leading logistics real estate investor and ecommerce logistics services provider along the BRI” said Mr Zhang Guobiao, Chairman of Forchn Holdings. Forchn International is the overseas headquarters of Forchn Holdings. Forchn is a Shanghai-based investment holding company established in 1992, specializing in e-commerce logistics services, ecommerce real estate, health & wellness, manufacturing and financial services. Its numerous regional holdings include the SGX-listed REIT with an asset portfolio of S$1.3 billion (EC World REIT), focused on e-commerce and specialized logistics real estate. Forchn was also a founding shareholder of Alibaba’s Cai Niao Network and Ruyicang E-commerce Logistics Services. Its recent acquisition of the Hangzhou Fuchun Resort marked the Group’s entry into the highly promising health and wellness services and real estate sector in China. Its current portfolio of well-known China brands also includes the 400-year old cutlery brand, Zhang Xiao Quan.